Staff Perspectives – Teach. Empower. Transform. My name is Terrell Hawkins, and this year I’m a program instructor for FLOC’s Scholars Program. As a FLOC instructor, some of my responsibilities include helping to motivate students in achieving goals in within the classroom and in life, helping them to mature into young adults, and helping them graduate and go onto post-secondary education. My work has included helping students with their homework, getting to know students outside the workshops on field trips, and most recently, planning and leading an elective hour with the 6th through 8th graders. In connecting with the students early this year, I noticed they have a great respect for me as a graduate and former student-athlete of Howard University in Washington, DC. The kids question me frequently about school and football, so I felt a fitness elective would be fun and relevant to their interests. So far in this elective workshop, students have learned important stretches that are good for those who play sports, as well as general health and wellness. We have played dodgeball and worked on the skills used for dodgeball (such as hand-eye coordination, agility, strength training and aerobic training) which are also applicable to other sports that the kids are interested in. Between the numerous papers on my desk requesting to be in my elective and kids saying they are having a great time and learning, I know I’m impacting kids in a positive way, and this means everything to me. OSSE’s mission to remove barriers and ensure children receive a great education, coupled with SBE’s policy leadership, advocacy, and oversight will help our city move closer towards a city where every student has a viable path to a postsecondary degree. Similarly, DCPS Chancellor Kaya Henderson’s stated goal is to ensure that every child have equal access to learning resources. 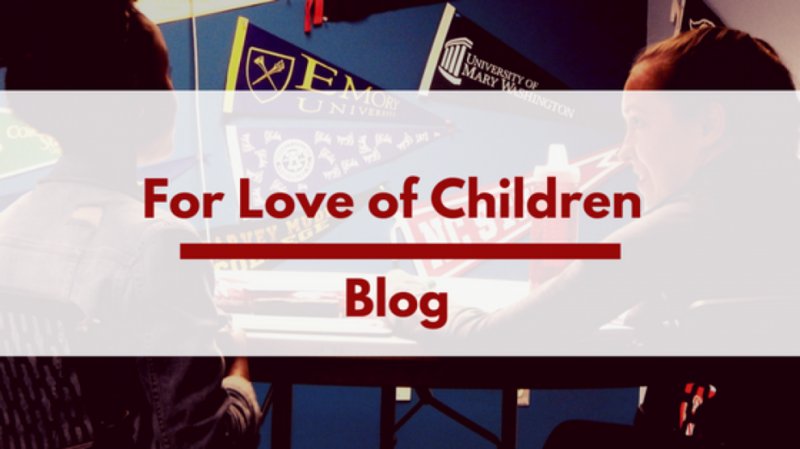 As the Deputy Director of For Love of Children, I know we can bring this educational justice to our city. I know that out of school time programs play critical roles in ensuring every student’s successful path. A nationwide study by the Afterschool Alliance showed that DC has the highest after school participation rate in the U.S., yet we ranked 49th in the percentage of low-income children enrolled in an afterschool program. Over the past 50 years, FLOC has served more than 10,000 children, turning disparity into opportunity. 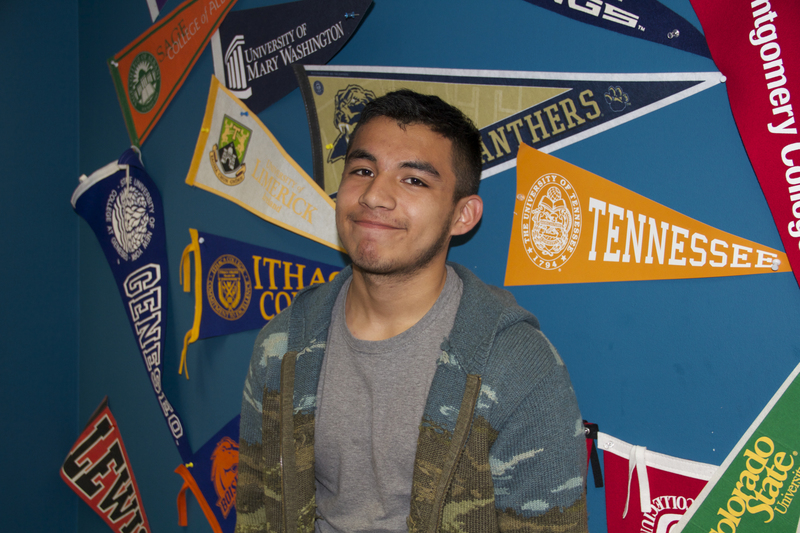 Currently, 100 percent of our seniors graduate high school and over 70% have graduated from postsecondary or are persisting towards a degree. FLOC sparks community transformation one young person at a time by ensuring access to quality afterschool services that lead to postsecondary success. FLOC programming focuses on youth empowerment by building critical thinking, leadership, and advocacy skills that dramatically increase readiness for postsecondary education. Through our signature Neighborhood Tutoring and Scholars Programs, we intervene early and expose students to educational opportunities and career experiences that lead to proven success. 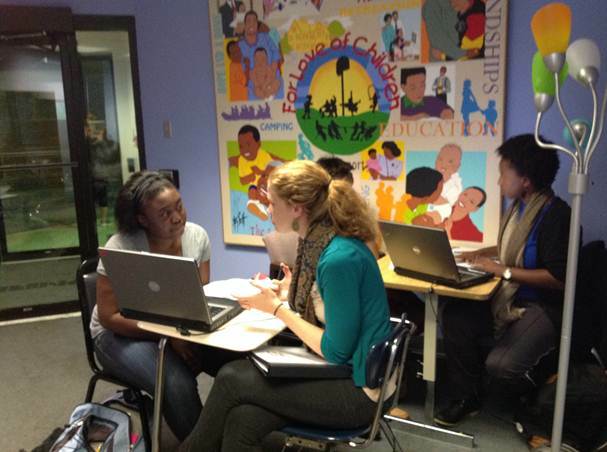 We understand the exceptionally powerful role partnership plays in academic success. We’re here today to recommend that OSSE & SBE increase their data sharing partnership with out of school time programs serving elementary and middle school youth. With this access to student-level data, FLOC and our peer organizations could improve the educational supports we provide our students and better prepare them for the next step in their educational journey. We also recommend OSE & SBE more actively engage highly effective out of school time programs broadly in strategic discussions about raising postsecondary readiness rates for our community’s most vulnerable youth. As we know, students spend over 300 hours a year in out of school time programs. Our data-driven programs have measureable success guiding students toward postsecondary degrees. Thank you, again, for the opportunity to testify. I look forward to working with you this year. Last week, FLOC held the 9th Annual Recognition Event and Empower Awards at the Woman’s National Democratic Club. The event was well attended with a great mix of students, families, and volunteers from both the Neighborhood Tutoring Program (NTP) and the Scholars program. What I loved most about the event was that we highlighted everyone together. All of our honorees were recognized for embodying the values of dreaming, advocating, and bridge building. For those who were not able to attend the event, I would like to share some of the important moments of the event. The first is a sentimental moment where a colleague and I were able to honor one of our FLOC advocates who had recently passed away. Her name was Fanny Canar and she first arrived at FLOC’s door in the fall of 2006 to get tutoring support for her daughter. Although NTP was not the right fit for her daughter, she ended up enrolling her into the Scholars program and later became an advocate for many other families who needed FLOC’s free educational services. Over the course of 8 years, Fanny would ask questions about the enrollment process, take applications and she would even follow up with families when we needed help. She was a true believer of FLOC and she will be dearly missed. I am so blessed to have known her and to have participated in the portion of the ceremony commemorating her. Another memorable part of our ceremony was when we honored our 8th graders for being halfway to college. We named that portion of the ceremony, “Halfway Day 2014”, because that is exactly what my mentor did for me when I was in 8th grade. She bought shirts with our college graduation date on the front for everyone in my class and she encouraged us to dream and plan for that date. I was strongly impacted by her gesture and her involvement in my life that I thought it would be appropriate to replicate that with our 8th graders. 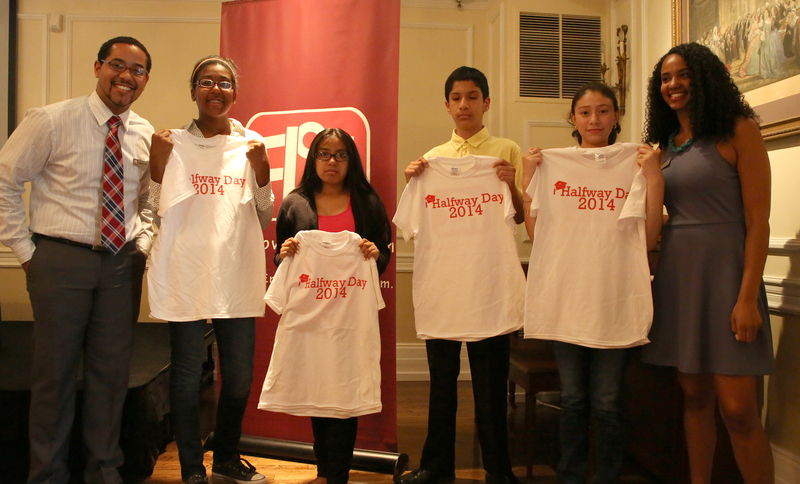 Here is a picture of the four 8th graders who attended the event and received a shirt! Eighth graders celebrate being halfway to college! Finally, the event ended with a very touching and powerful video that showed our students, families, and volunteers talking about their dreams, their bridge-building skills, and their motivation to be advocates. Overall, the event was a success and I am so glad to have been part of the planning process. I couldn’t have done it without my co-chair Kimberly Davis, the Scholars Program College Access Coordinator, and the committee: Elizabeth Metz, the Recruitment and Outreach Manager, Jim Coleman, NTP Site Coordinator, Lauren Ballinger, Scholars Program Instructor, and Ibsaa Adam, NTP Site Coordinator. Thank you to everyone who attended the event and all of the FLOC staff who helped us bring the event to life! We couldn’t have done it without all of you! The day was cloudy and gray, but once we arrived at Tubman Elementary School I felt like everything had brightened up. 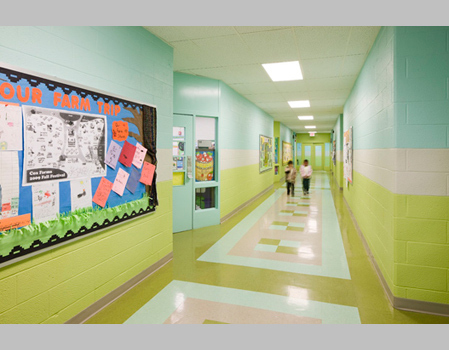 The blue and green hallways were covered by colorful drawings and art pieces made by students. In a few minutes, the kids got out of class and walked down the hallway with their teachers. 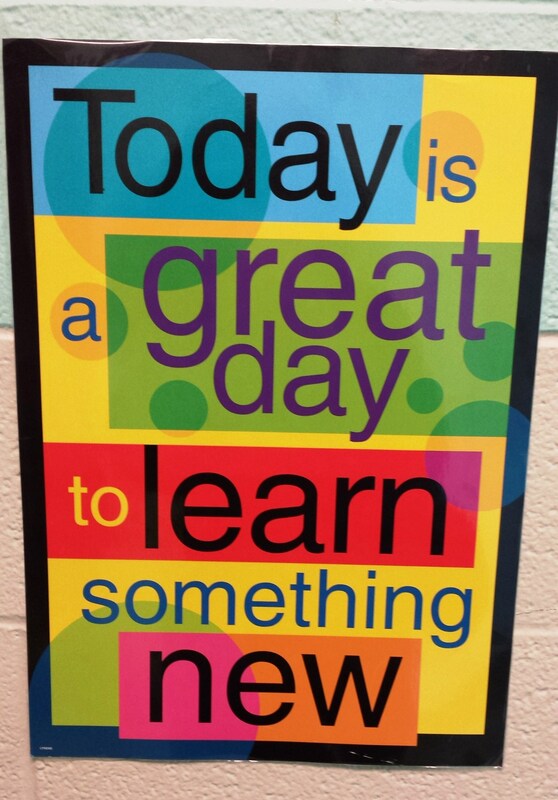 In front of the art classroom, where FLOC program takes place, there was a colorful poster that read “Today is a great day to learn something new.” As I was reading this, I wondered “what new thing will I learn?” Soon, the students and tutors arrived to start the FLOC reading program. There were a few new tutors reviewing the lesson materials and getting ready to start. They looked excited to meet their students. Before the start of the program, the students had fun playing Connect Four, Mancala and other games. Franklin, a first grade student, was playing while the other students started the tutoring session. Since his tutor was absent, one of the new tutors volunteered to work with him for the day because her student was also absent. It was interesting to see the dynamic between a new tutor and a student that has been attending FLOC program since fall. The new tutor looked for ways to keep him engaged and motivated to complete the exercises. They were playing games to practice Franklin’s phonic and spelling skills. After a while, they took some time to have a snack and talk in the hallway. To continue practicing, Franklin had to read aloud every name that was written under the drawings of elephants that were hanging on the wall. He recognized some of the names and told his tutor that the students who made the drawings were his friends. It was clear they were both happy to work with each other for the day. This was the first time I have visited FLOC program at Tubman Elementary. The program is small compared to the other programs at FLOC but it also has tutors and students who are committed to succeed. Both staff members assigned to the program, Queen and Ibsaa, show attention to the children and their tutors. They take their time to help them, answer their questions and make them feel welcome. At the end of my visit, I thought about the quote on the poster in front of the art classroom. Spending a few hours at Tubman reminded me of the importance of having FLOC programs at the schools because it enables more kids like Franklin to receive the academic help and one-on-one attention they need. (Lisvette García is the Bilingual Recruitment and Outreach Associate at FLOC). As anyone that works with students will tell you, it’s not always about what you teach them, but the things that they teach you. This spring, FLOC staff has been working hard enrolling and placing more students and tutors into our programs for the spring semester. 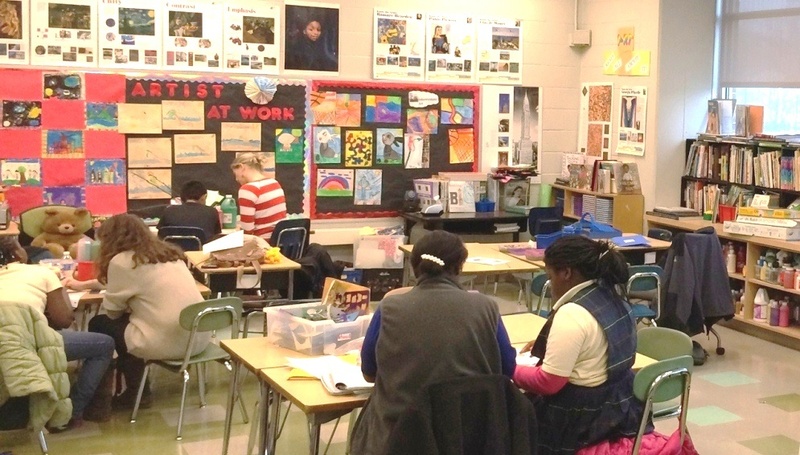 One of our new students, Bianca, attends a French immersion school. While reading through her application and gathering some pertinent information to include for her tutor, I noted her school on her student placement. In Washington DC, I am very used to seeing bilingual schools that our students attend, but this was a first for me. During her first tutoring session, while getting to know each other, she and her tutor discussed her school. 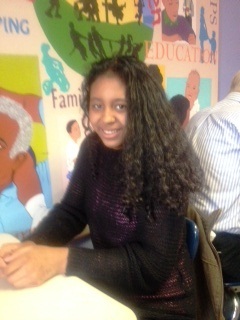 Bianca, one of our new 7th graders, has been at this school since first grade, and every subject is taught in French. When they transitioned into the curriculum, her tutor, Ben, wanted to see how well she knew unit 5, which is multiplication and division facts. 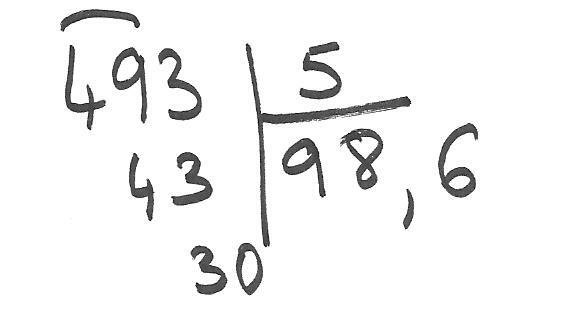 Example of a long division exercise using the French style. During the session, he asked her to switch roles with him and explain him the concept of division. After a little pause, she explained that she can only describe it in French. Bianca then illustrated the box for the long division symbol, which looks completely different from the way most schools teach it. In case you are wondering, the word division in French is répartition. Math may be a concept that is universal but, as her tutor realized, some of the explanations can still be lost in translation. (Catherine Brenner is an NTP Site Coordinator at FLOC). 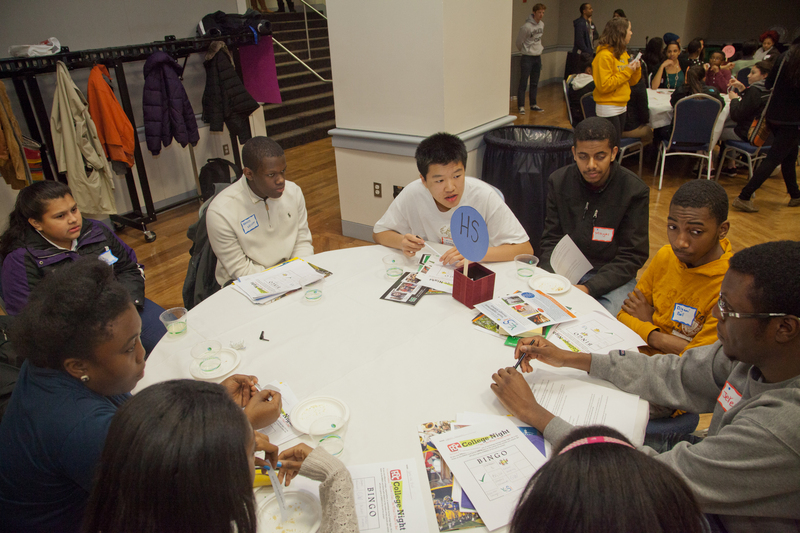 High school students converse with post-secondary students during the roundtable discussions. 1. The Spanish speaking parent workshop was met with tremendous optimism. Spanish speaking parents participate in a workshop facilitated by Aurin Agramonte and Lisvette García. As we integrate more Spanish speaking families into FLOC, it’s our job to find ways to accommodate their presence at our events. The college process is more than a student experience, and it’s important that students’ families are just as informed as they are. The Spanish speaking workshop provided nearly identical content to the English version next door, giving information parents’ were extremely receptive to as well as a platform for them to share their thoughts and experiences. It was so well received that many of the parents requested additional workshops in the future for more chances to learn and communicate, something we’re now in the process of implementing. 2. The post-secondary networking workshop was the highlight of the night. 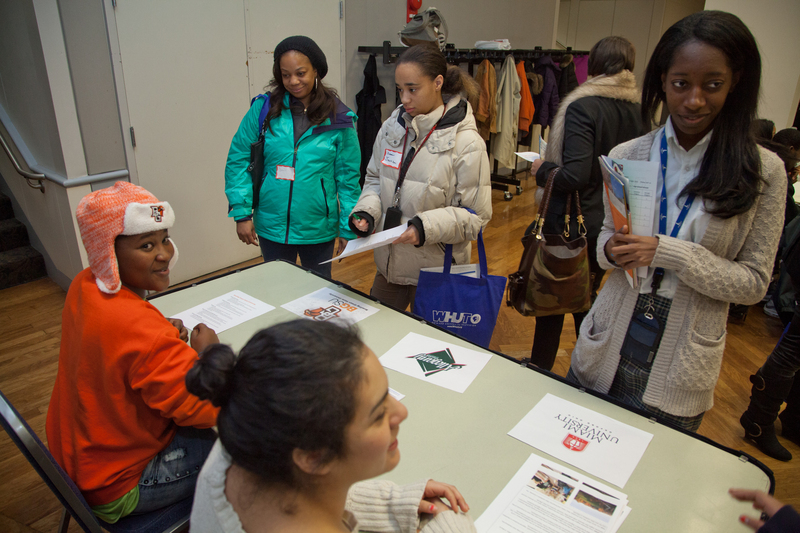 In this workshop we had FLOC volunteers meet with our current post-secondary students to learn about potential avenues stemming from their studies, and to learn about jobs that may or may not be directly tied to their majors. Both sides felt the time was very worthwhile, and it’s always exciting to continue to help our students beyond high school. 3. The number one question I was asked during the college fair concerned my alma mater’s athletic program. Jim Coleman addresses questions from a student during the college fair. And that’s totally OK. 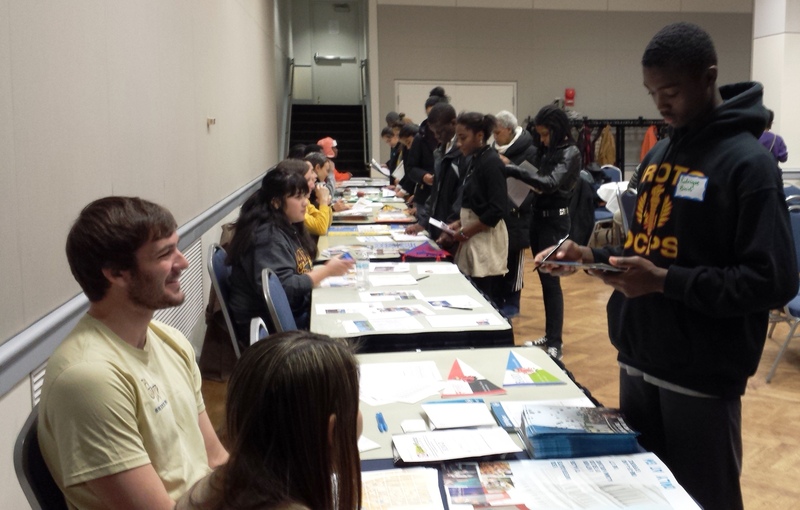 The vast majority of the students that came to my booth weren’t entirely sure what they wanted to study, and handing them a list of seventy undergraduate programs can cause more than just anxiety. Comfort on campus can be hugely influential in the mental well-being of a college student, so I was more than happy to talk about my school’s demographics, clubs, and sport teams. 4. Our students have high aspirations. This was self-evident when the biggest complaint from the students regarding the event was that there weren’t enough Ivy League schools represented during the college fair. I fielded a lot of questions in regards to certain majors, specific professors, the sincerity of advising departments, and professional placement. Overall I was very impressed. Najé, a current post-secondary Scholar, proudly represents her college. So maybe this isn’t something I just figured out but how amazing is it that FLOC can offer help and guidance from first grade through high school until a post-secondary degree? These same individuals come back to help current students navigating the same process they went through, while simultaneously creating some type of beautiful, organic, self-sustaining network. FLOC now has a Postsecondary Success Coordinator who is working to expand this network to not only help current college students, but to aid in job placement as well. There’s a reason I chose to suspend my life for a year to volunteer here, and nights like these make it easy to remember why. 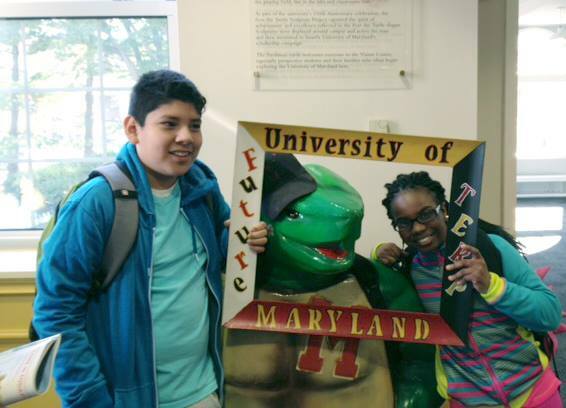 This year the Scholars program is implementing a new advising model to ensure that all students are prepared for middle school, high school, college and beyond. Students meet with an advisor four times a year and submit their transcript and quarterly grades to inform these conversations. As a Scholars Advisor, I have had several inspiring experiences speaking with the wonderful students during advising sessions. One specific experience was with an 11th grade high school student. While we were talking and looking at her transcript, I started to realize that this student was not aware of her true academic potential and of all the wonderful opportunities college would allow her. I spoke with her about several options that she could pursue based on her well-rounded academic, extracurricular, and community service experiences. She never knew that there were actually college degrees that would enable her to focus dually on her love for English literature and language as well as her fascination with business. When I brought up the idea of a business and liberal arts degree program possibility, her face lit up. The prospect of college became doubly as exciting for her. We talked about how college would enable her to study whatever she wanted, while also allowing her to continue with her love for dance and cheerleading. At the end of our meeting, I realized how important FLOC can be in the process of students identifying and unlocking their full potential. (Tami Burger is a Scholars Social Work Intern at FLOC).